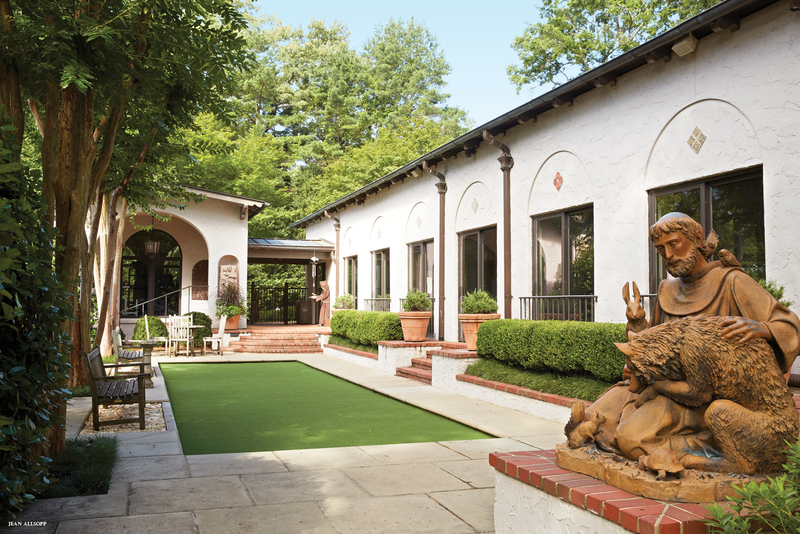 Renewing the grounds and terraces of a vintage Spanish Colonial Revival manor in Mountain Brook, garden designer Kelly Hulsey gave it a lush setting for alfresco living in keeping with its elegant yet relaxed style. ABOVE Vintage cast-iron urns flank the original, ornate entrance screen. 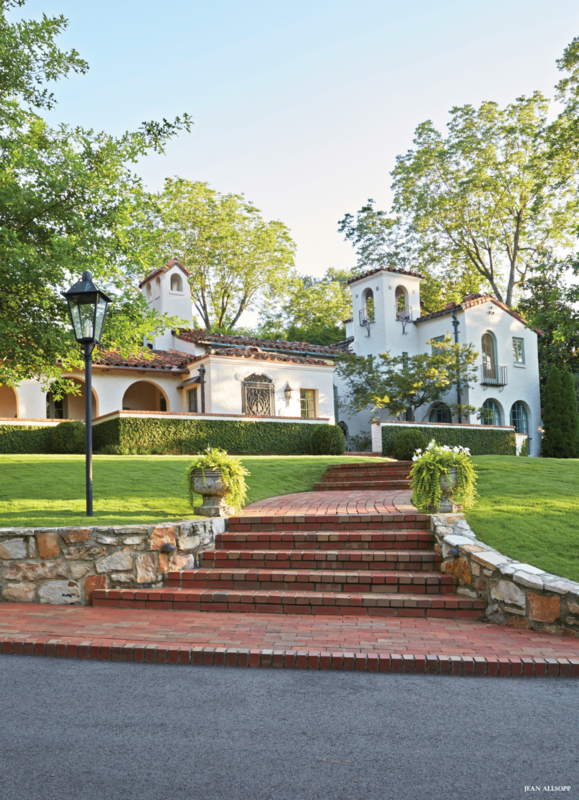 The Spanish Colonial Revival style has an undeniable glamour that rose to popularity in the 1920s, especially in California. With its Mediterranean roots, the architecture often highlights outdoor spaces and greenery. 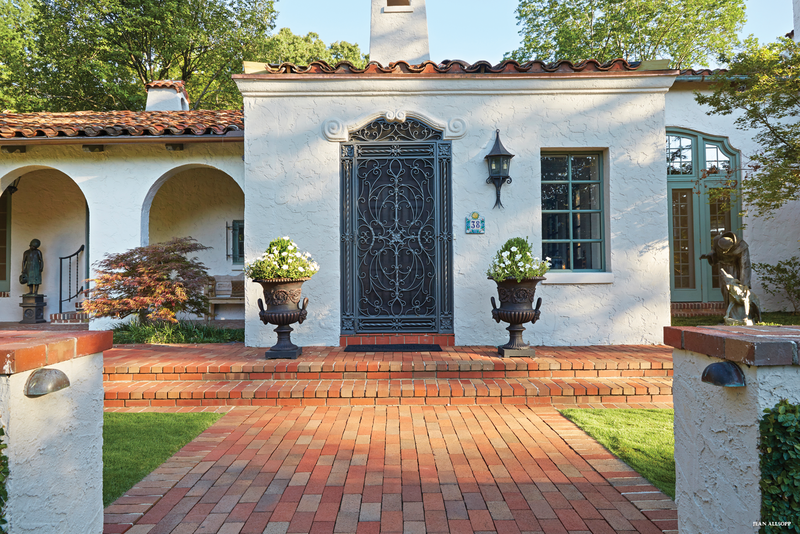 Such elements served as inspiration for garden designer Kelly Hulsey as she renewed the surroundings of a fine Spanish Colonial Revival manor, the Mountain Brook home of Tom Lowder and Susan Carrington. Built in 1928, the handsome house was purchased by Tom in 1986. Over the years, it received sensitive additions by Birmingham architects John Carraway and James Carter. The result could easily have been transported from Beverly Hills—or from Holman Ranch, the Carmel Valley property Tom and his late wife, Jarman, purchased a dozen years ago. The ranch has a house of the same style and vintage as this one, as well as vineyards and olive groves that produce fine wine and oil. ABOVE The graceful 1928 design features arched openings and picturesque details. Garden designer Kelly Hulsey put in a lush lawn dotted with oaks and an emerald arborvitae at the far corner. Creeping fig cloaks the low wall around the terrace. The now-sunny front got a lush new lawn, overcup oaks, and magnolias to fill a gap at the property line. (“Good screens make good neighbors, ” Kelly says.) The designer planted a large maple tree on the left of the front terrace to balance the mature one to the right of the entrance. “I like to work incrementally, putting in plants in stages to see what will go well together, ” she says. Echoing the red tile roof, the red-brick courtyard behind the original house boasts a long arbor, a fountain, and a covered loggia where Tom and Susan often dine. Kelly adorned the courtyard with ample containers planted with large globular boxwoods and decorative plants that Susan swaps out three times a year. Steps at either end of the courtyard lead to an upper terrace where Kelly installed drainage to keep a new paver-framed bocce court dry. Here and elsewhere on the grounds sit bronze sculptures Tom has collected over the years. Some depict St. Francis, a symbol of harmony with nature and an apt companion to the style since Franciscan monks founded Spanish Colonial missions from Mexico to northern California. ABOVE A statue of St. Francis (artist unknown), presides over the upper terrace. Dedicated to recreation, the buildings along the terrace house a gym and an indoor pool. Lofty crepe myrtles, spectator benches, and suitably spherical boxwoods edge the bocce court. Peacock Pavers create the frame around the court. ABOVE Bronze sculptures, some purchased by Tom Lowder from the historic Marinelli Foundry in Florence, Italy, serve as artful accents. 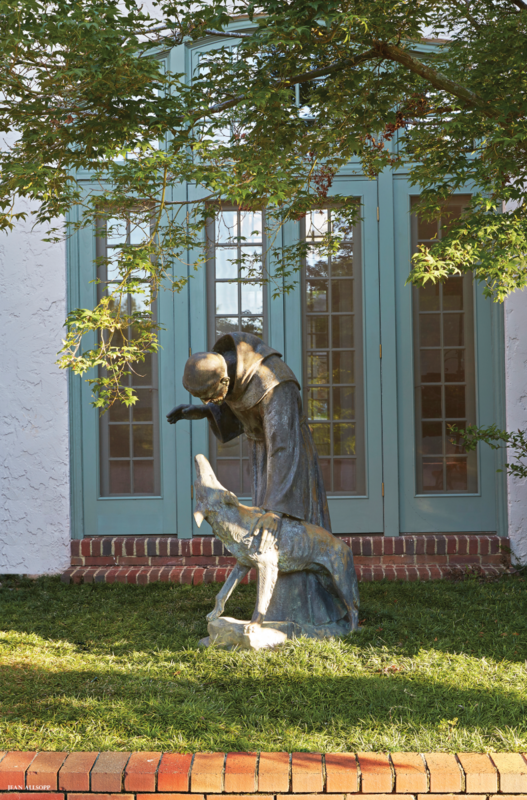 Sculptures include Resting Model by Aroldo Bellini, St. Francis and the Wolf of Gubbio by Giovanni Cappelletti. 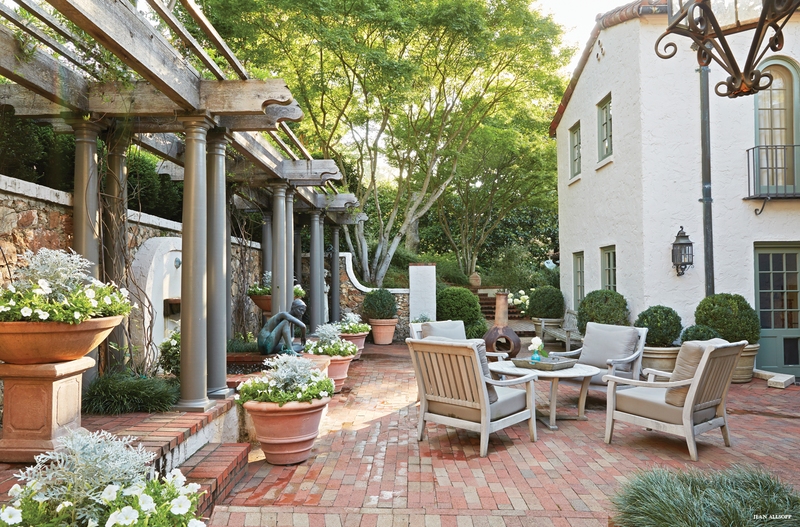 ABOVE A fountain and a pergola trained with Carolina jasmine create a beautiful backdrop for the spacious courtyard behind the house, where terra-cotta containers hold mature boxwoods and decorative plants that change every few months. Outdoor furniture from Blackjack Gardens creates an intimate dining area just off the kitchen.